We don't just say we "do it all." We do "do it all." We combine the most up-to-date offset printing processes to give our clients many options to choose from. We utilize a state-of-the-art Heidelberg JDF workflow with colors standardized via GraCol 7 Certification. A computer-to-plate (CTP) workflow, in which an image is directly output from desktop publishing software to a printing plate, ensures accurate color reproduction and minimal dot gain. Also, we can accommodate sheet sizes up to 28” x 40”. In a growing digital world, having full digital printing capabilities is a must. We offer colors standardized to GraCol7 Certification on all our Xerox DocuColor digital printers. In addition, our equipment is capable of Pantone color-matching with Clear dry ink application in-line. We also offer in-line booklet making, which includes both folding and stitching. Great design can be key to having a product that stands out, but part of having a great design is consideration of the medium. We take pride in our specialty printing techniques, setting your product apart from the rest. 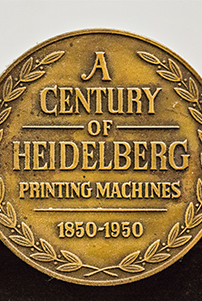 From die cutting to foiling to embossing, we can do it all. It's our attention to detail, as well as our ability to maintain sweet harmony between a variety of hardware and software technologies, that keeps our customers pleased. While prepping art for print production is no small task, utilizing modern RIP systems and dynamic job imposition, our technology bias lets us turn your job around faster and more accurately than the competition. Versatile format. Digital controls. Eco-friendly. All with top speeds of up to 16,500 sheets per hour. What you get with the Speedmaster CX 102 is quality with no-compromises and no less than on-time execution. The Speedmaster SM 52 continues to set the standard in its format class. With features such as the expanded stock range up to 0.6 millimeter and advanced press controls, the SM-52 is the press others wish they had. And, with our CPC 2000 color console, we can nearly guarantee accurate color every time! The things that you take seriously, we take seriously.